Tracking people is a key technology for robots and intelligent systems in human environments. 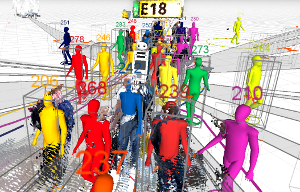 Many person detectors, filtering methods and data association algorithms for people tracking have been proposed in the past 15+ years in both the robotics and computer vision communities, achieving decent tracking performances from static and mobile platforms in real-world scenarios. However, little effort has been made to compare these methods, analyze their performance using different sensory modalities and study their impact on different performance metrics. In this paper, we propose a fully integrated real-time multi-modal laser/RGB-D people tracking framework for moving platforms in environments like a busy airport terminal. We conduct experiments on two challenging new datasets collected from a first-person perspective, one of them containing very dense crowds of people with up to 30 individuals within close range at the same time. We consider four different, recently proposed tracking methods and study their impact on seven different performance metrics, in both single and multi-modal settings. We extensively discuss our findings, which indicate that more complex data association methods may not always be the better choice, and derive possible future research directions.